The team at Austral Bowling Club are here for you during your difficult time – the passing of a loved one is never easy so let our experienced staff assist you in planning your wake gathering. Simply select one of packages included in this brochure and our team will organise the rest, leaving you with more precious time to say goodbye to a cherished one. All Wake Packages include complimentary room hire! Should you require further information or would like to discuss your event at Austral, please do not hesitate to contact us. *Minimum 20 Adult Guests - Available Monday-Saturday 10am-5pm. For more information about our WAKE PACKAGES please CLICK HERE! 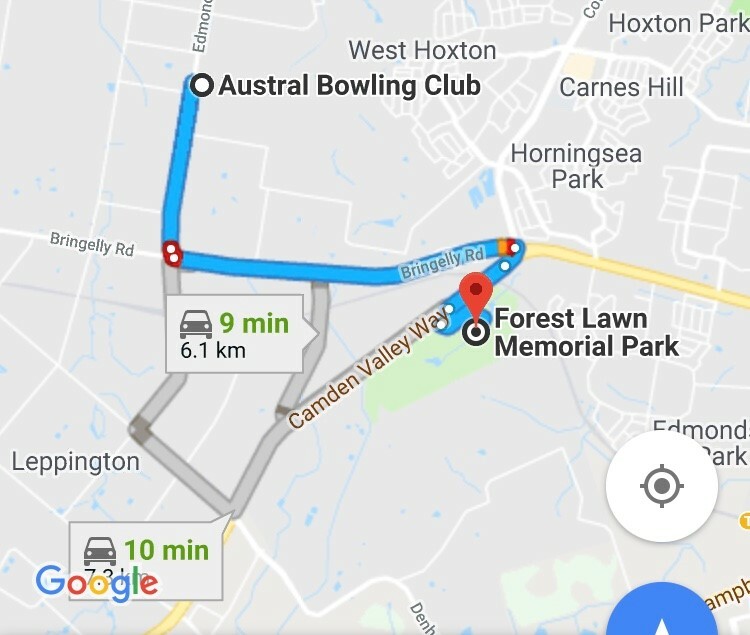 Just a short drive from Forest Lawn Memorial Park/Leppington Lawn Cemetery, Austral Bowling Club is the ideal location to host your family gathering!